My studies, for more than the past decade, have slowly revealed the various mechanisms of action of statin drugs in the production of side effects. First, I learned about statin drug inhibition of glial cell cholesterol, so vital for memory. Then on the basis of a detailed study of the inevitable statin associated mevalonate blockade of CoQ10 and dolichol synthesis, I learned about the consequent neuropathies, myopathies and chronic neuromuscular degeneration. And now I know why many of the statin side effects are permanent and why weakness and fatigue are such common complaints. Many statin victims say that abruptly, almost in the blink of an eye, they have become old people. All the drug companies ever really told us about the mechanism of action of statins was that they were reductase inhibitors. This reductase step that was so interesting to drug company researchers, just happened to be at the very beginning of the mevalonate pathway, responsible for the synthesis of not only cholesterol (our target at that time) but also such vital substances as CoQ10, dolichols and selenoproteins and even normal phosphorylation. It seems that our brains are so dependent upon cholesterol for the formation and function of memory synapses that special cells in the brain, our glial cells, synthesize cholesterol as it is needed. Naturally this glial cell process was inhibited by statin drugs. We had an obvious culprit. The full range of statin side effects goes far beyond cognitive dysfunction to include behavioral and emotional disorders, chronic nerve and muscle damage and an ALS-like neuromuscular degenerative process as major categories of damage. Thousands of statin users have been afflicted with peripheral neuropathies with a tendency to be resistant to all traditional medical treatment. I soon discovered the special role of CoQ10 as an anti-oxidant to our mitochondria. We have dozens of natural anti-oxidants but only CoQ10, with a free radical quenching ability some 50 times greater than that of vitamin E, is bonded directly to our mitochondria, vital to both its structure and function. We must remember that our mitochondria are in immediate contact with oxygen, front line warriors, so to speak, in the struggle to obtain life-giving oxygen without sustaining excessive oxidative damage. The inevitable result of excessive free radical accumulation is an increase in the rate of mitochondrial mutations. The fact that we must repair thousands of mitochondrial DNA mutations daily in our bodies from the normal process of converting food into energy is not widely known. This daily load of oxidative damage is due to the excess energy of oxygen radicals released during normal metabolism. Each one of these substitutions and deletions on DNA strands must first be identified, then excised and finally replaced with the correct form so that we continue to function. Our dolichols are vital to this process in that each step of our mitochondrial DNA correction requires a specific glycoprotein-derived enzyme. Dolichols orchestrate this entire process of glycoprotein synthesis and statins have long been known to inhibit dolichols. Some studies demonstrate as much as a 50% decrease in CoQ10 availability within a few weeks of starting statins. The end result here is a one-two punch wherein statins inhibit not only dolichols, corrupting our DNA damage correction, but CoQ10 as well, increasing our damage load. Predictably the inevitable effect is increased mitochondrial DNA damage — considered by many authorities to be the mechanism of our aging process as well as that of many chronic diseases. Statins block the synthesis of CoQ10 and dolichols, thereby contributing directly to the premature common chronic ills of aging. Since this involves normal physiologic processes, it is silent. By the time we become aware of it, it is already far too late and the damage has been done to those susceptible. 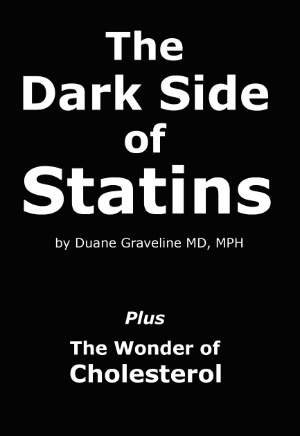 This, in my judgment, is the truly Dark Side of Statins.